One of the pillars of Western literary tradition, VergilÆs Aeneid is also a terrific read: the story of a man whose city is destroyed in war, and of his journey to find his place in destiny. This epic has it all: adventures on the high seas, passion, battles, monsters, magic, meddling gods, and struggles that test the moral fiber of both men and women. 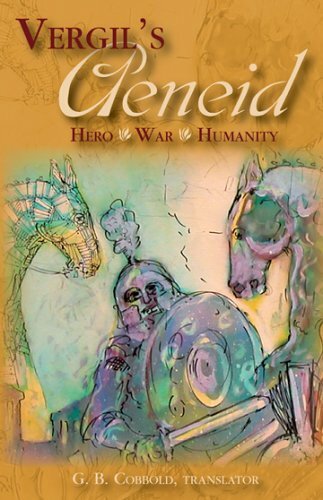 Vergil's Aeneid: Hero, War, Humanity provides a refreshingly modern narrative which engages modern readers with as much power as the Latin original itself. 'Nothing that happens today has not already happened in the past, and there is no tale that has not been told before'. So remarks Cobbold, who believes that Aeneas' journey applies to former and current world situations. Since the author has intentionally written for the person with no background in Latin, the storyline and references are as easy to follow as in a modern story. The reader familiar with the Aeneid in Latin, or just reading parts of it in Latin, will benefit from a text easily understood. Students reading the Aeneidfor the first time in Latin will profit from following the story itself and grasping the deeper theme relevant to human experience. Reading an English version with such vitality should encourage Latin students to search in the Latin for the equivalent meaning the English was trying to bring out...Since the translation is in prose, students reading the Latin will more easily appreciate the original wording of the poetic structures. ...The translation achieves the vibrancy of a modern style by deleting names or references not necessary to following the story and by adding words or phrases to explain context that is not familiar to the modern reader without a classical background. Compared to the style of the original Latin, the sentences are shorter, avoiding the standard Latin syntax; though beautiful in the original, lengthy sentences do not evoke the same immediacy for English readers. Unencumbered with footnotes for explanations, the text moves along smoothly and dynamically. The author has purposefully prepared the English version as a novel. As he points out in his introduction to the translation, he has intended to write the story with a strong plot for today's readers, thereby maintaining the excitement of the story. Both the headings and the illustrations throughout the book keep the reader involved in the action. Changes in scenery are handled with a direct transition. The style of the writing captures the purpose of Vergil. Cobbold's responsible popularization has effectively combined the scholar s knowledge with a novelist s touch. While some teachers might feel that having their students read the Aeneid in prose is not as authentic as in poetry, the characteristics of the novel fit the purpose of the original well telling a story using the past to inform the present and add a contemporary feel to the message. Moreover, students, especially younger students, will probably find the prose less intimidating and more accessible. The illustrations and accompanying sidebars preserve the flavor of the original epic. The approach of the translation in the form of a novel allows the class to concentrate on the meaning and theme. If read to supply context for reading the Latin, the prose enhances the students appreciation of the original Latin poetry. Appendix I briefly outlines the plot, with about one paragraph per book. Appendix II provides significant events in Roman history. Appendix III fills in the genealogy of the cast of characters. Appendix IV provides 16 thought-provoking discussion questions, intended for a study group, but equally suitable for use in a class, either for class discussion, written essays, or panel discussions. Appendix V identifies the main characters of the Aeneid. Vergil's song of the Roman Empire still resounds in the ears of listeners as it has for two millennia. Now, G. B. Cobbold has translated the great Roman epic into English as a novel. Here the excitement, adventure, romance and glory of Vergil's classic emerge from a vigorous style and evocative prose. The narrative depicts and reveals individuals and circumstances, conflicts and resolutions in a manner that is as exciting as the best current adventure stories. This translation of the Aeneid makes Vergil's epic accessible and entertaining for English speaking students. At the Aeneid's core remains the moral question: do I do as I want or as I ought? Cobbold depicts Aeneas' decisions and dilemmas in this light, telling Vergil's story in simple yet elegant English. The prose clearly depicts the people and events of the epic in a lucid and vivid style providing the edifice that displays Vergil's presentation of the moral quandaries of humanity. This edition of the Aeneid; is embellished with the enjoyable illustrations of Thom Kapheim whose drawings show people and events in a light yet meaningful way.